Hunting blinds, deer feeders and fish feeders are some of the most effective tools you can find for attracting fish and wildlife for observation, photographs or hunting. When you want outdoor products that last reliably for years of use, look no further than Texas Hunter Products' fish feeders, deer feeders, deer stands and hunting accessories. Whether you're looking for automatic fish feeders controlled by a digital timer or deer stands that will keep you warm and concealed throughout your time in the great outdoors, you'll find some of today's best products among our selection. That's because Texas Hunter Products is more than just a business — we're a way of life dedicated to helping people across the country discover their love of outdoor adventures. It all began in 1954, Texas Parks and Wildlife commissioned Alvin Braden, from Fredericksburg, TX, to design a wildlife observation tower for a major wildlife research project. Braden's deer blind tower soon gained fame throughout Texas. His design was ideal for hunters looking for a better way to spot deer and other game. Texas Hunter Products began creating hunting blinds that later evolved in style and design to the deer stands and hunting blinds we offer today. Today, Texas Hunter Products designs, manufactures and sells a vast variety of top-quality products that meet the needs of outdoor enthusiasts across America. We've proudly pioneered some of the industry's most innovative designs, such as the first solar-powered deer feeders. Our brand embodies our passion for delivering reliable results and treasuring the spirit of the outdoors. Many of our customers use a road feeder and stationary deer feeders in tandem on larger properties and then observe wildlife from one of our deer blinds. We also offer hunting chairs and hunting stools and other accessories to make your wildlife excursion as comfortable as possible. Among our selection, you'll find everything you need for success in your hunting or observation endeavors. 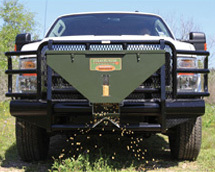 Why Choose Texas Hunter Feeders? Since our beginnings over 65 years ago, Texas Hunter Products has become a name synonymous with quality and durability. Our fish feeders, deer feeders, hunting blinds and other selections are among the highest rated in the industry, so you can trust that your purchase from Texas Hunter Products will meet your needs for generations to come. See why wildlife enthusiasts across America use our deer stands and fish feeders for their ponds and lakes, private land, hunting properties and vacation spots. Contact us online or at 800-969-3337 for more information, or browse our selection to place your order now.